Baruch Spinoza (1632-1677), scion of a leading Jewish family in Europe's most cosmopolitan city in the seventeenth century, Amsterdam, provided the intellectual architecture for a philosophic structure which would level current assumptions and conclusions. For his endeavors, Spinoza was excommunicated by his own community and his name, Baruch-Benedict (which means blessed), became anathema both in the community he left and the larger community he never entered. During his lifetime, Spinoza's works were published anonymously, and even his posthumously published Opera contains neither place nor date of publication. His rise to a central position in the drama of humankind's search for truth came slowly but inexorably as human reason began to be more relied upon than divine dogma. Jefferson would have been one of the first Americans to have accepted Spinoza as his spiritual kin. 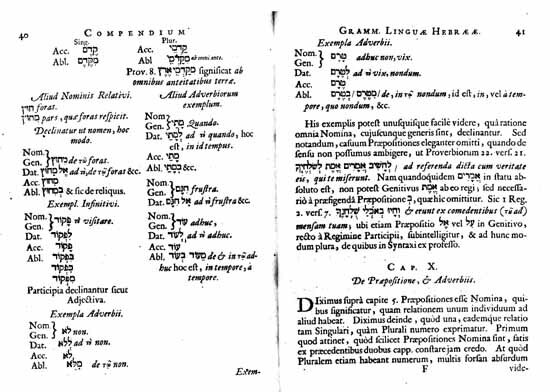 The fifth and final work in Spinoza's Opera Posthuma (with its own title page, pagination, and errata) is a Grammar of the Hebrew Language, Compendium Grammaticus Lingua Hebraeae. Spinoza was one of the first to subject the Bible to critical analysis but demanded that such analysis be rooted in a thorough understanding of the Hebrew language. Then, and only then, Spinoza states, may one turn to "the life, the conduct and the pursuits of the author-of each book ... [and] the fate of each book: how it was first received, into whose hands it fell, how many different versions there were of it, by whose advice it was received into the Canon, and how all the books now universally accepted as sacred, were united into a single whole."